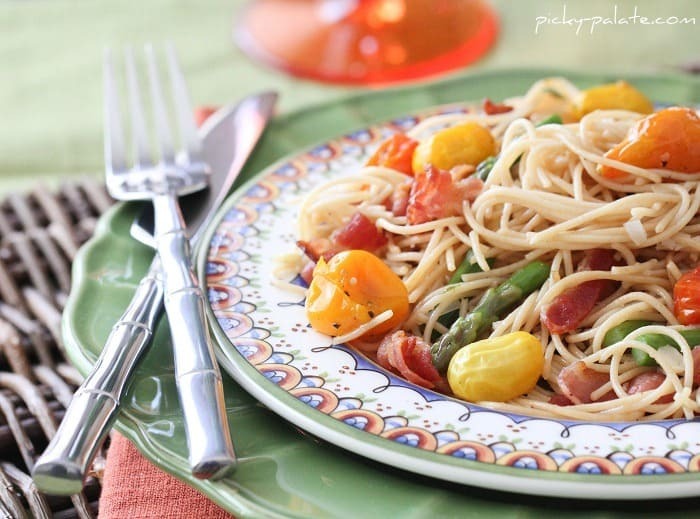 This Bacon Parmesan Summer Pasta is perfect for a quick fix dinner any night of the week! Packed with all of your favorite summer ingredients! Bringing back a recipe I posted way back in September of 2011. 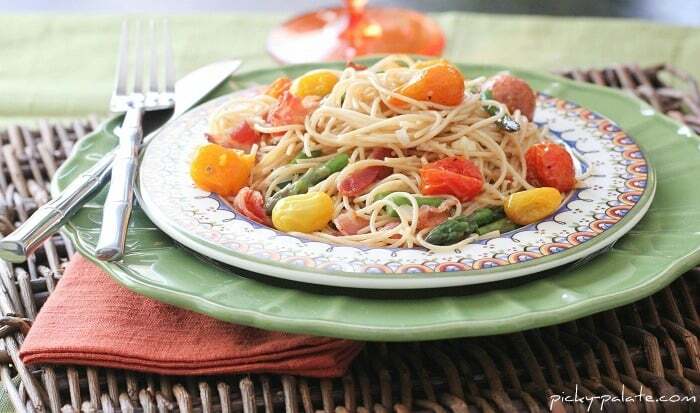 This simple pasta dish is colorful and could not be more simple to prepare. 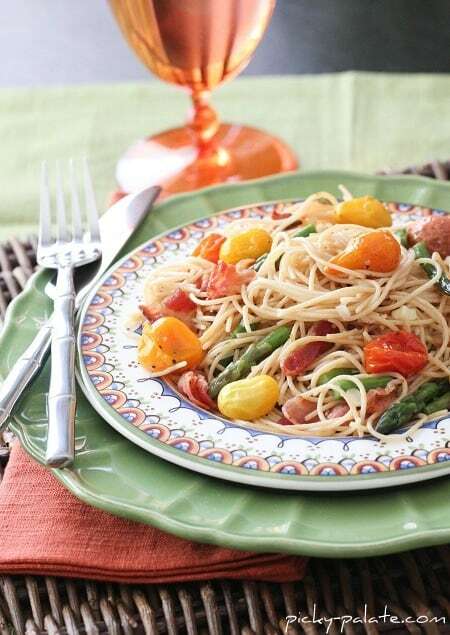 Love these simple dinner recipes! Hope you enjoy a little blast from the past today. I LOVE baby heirloom tomatoes. Roast them in the oven with a little olive oil, salt and pepper. They turn out incredible!! 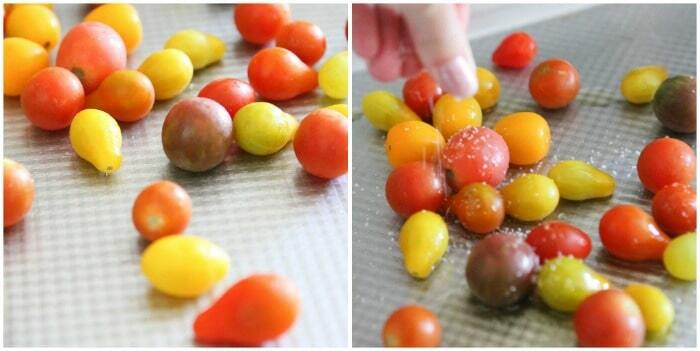 If you can’t find these tomatoes, feel free to use baby cherry tomatoes in their place. Look at this giant bowl of pasta! Gulp. Cook bacon in large Dutch oven or pot until crisped and brown. Transfer cooked bacon to a paper towel lined plate to drain oil. Once cooled, crumble into small pieces. Reserve bacon drippings. 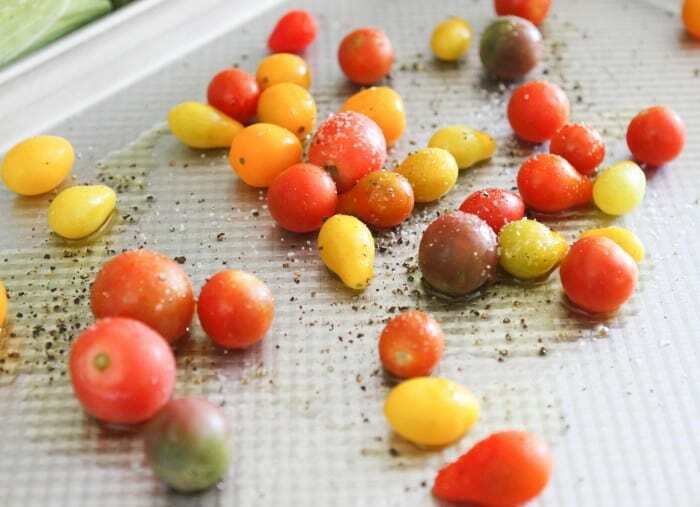 Place heirloom tomatoes onto a medium baking sheet, drizzle with olive oil and season with salt and pepper. Bake for 20 to 25 minutes, until juices start flowing and skin splits. Cook pasta according to package directions, drain and run under cold water to stop cooking. Set aside. Place 2 tablespoons bacon drippings into a large Dutch oven or pot over medium heat. Add onions and cook stirring until tender, about 5 minutes. Add corn and asparagus, cooking and stirring for 5 minutes. Add cooked pasta, bacon, tomatoes and Parmesan Cheese. Toss gently. Drizzle in 2 additional tablespoons of bacon drippings. Season according to your liking with kosher salt and freshly ground black pepper. Serve warm. What a nice fresh summer pasta! 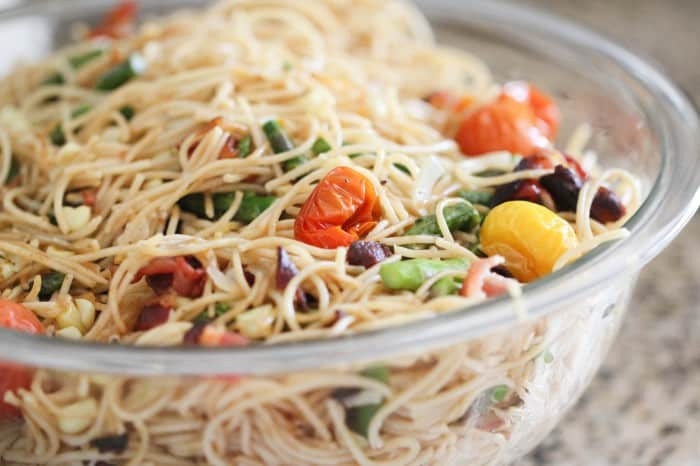 truly all the best stuff in one pasta dish! Need this gorgeous pasta now!! I love this! Perfect easy summer meal. This looks delicious! Very pretty on the plates. I work at World Market (Cost Plus), and we still carry them. Beautiful! All those tomatoes look amazing!! So good!! Tomato season is in FULL force right now here in Michigan – I love your gorgeous photos!!! 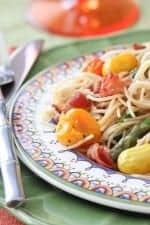 Great summer pasta for any night!! There is nothing on earth that bacon doesn’t make better! Thanks for sharing this recipe I am going to try it out!